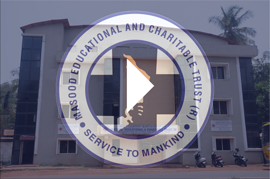 Masood Educational & Charitable Trust ® (MECT) was founded in 2003-2004 and are presently conducting General Nursing and Midwifery, Basic B.Sc. Nursing, P.B.B.Sc. and M.Sc. Nursing courses. The College and School of Nursing was sanctioned by Govt. of Karnataka in the year 2003 with a total intake of 60 students in each course. The course is recognized by the Apex body i.e Indian Nursing Council and Karnataka Nursing Council. The Institute is situated in Mangalore, the fast developing port city of Karnataka. The nursing programmes were started with a vision of providing nurses, who will be clinically proficient in delivering services to the individual, group, society, nation and the world at large. Our Institution, attempts to mould well-motivated young minds, to take on the daunting responsibility with grace and confidence, equipping them not just with knowledge that will help them assist doctors during critical or surgical operations but also with the sensitivity and gentleness required to administer efficient bed side care.